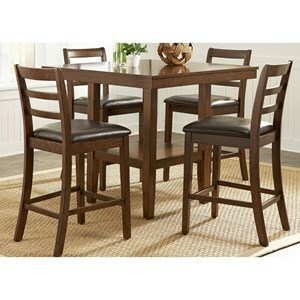 This All-in-One-Box five piece pub table set is a quick, simple and beautiful dining room option. Perfect for small spaces, the 42" diameter pub table houses a single shelf in its base, so you can save precious room space. The counter height chairs feature a contemporary ladderback design, along with black vinyl upholstered seats for exquisite comfort. 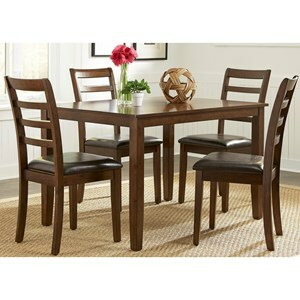 The Bradshaw Casual Dining 5 Piece Round Pub Table and Ladderback Chair Set by Liberty Furniture at VanDrie Home Furnishings in the Cadillac, Traverse City, Big Rapids, Houghton Lake and Northern Michigan area. Product availability may vary. Contact us for the most current availability on this product. Browse other items in the Bradshaw Casual Dining collection from VanDrie Home Furnishings in the Cadillac, Traverse City, Big Rapids, Houghton Lake and Northern Michigan area.